Contract bid documents called for a temporary sheet pile wall in order to make a side hill excavation for a new Deshon Equalization Tank. Independent reviews by the wall contractor and Peirce Engineering determined that steel sheet piling could not be installed as planned due to the presence of bedrock above subgrade. The wall contractor proposed and Peirce Engineering designed an alternate, shotcreted, soil nail wall that is approximately 270 feet long with a maximum height of 47 feet. As later required by the owner, the upper portion of the wall was designed and built as a permanent soil nail wall, 155 feet long with a maximum height of 21 feet. 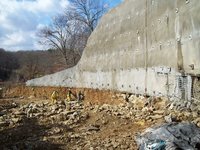 The lower, temporary portion of the wall would be backfilled upon erection of the precast, pre-stressed, post-tensioned concrete tank.